Apple's latest mobile operating system iOS 8 Firmware for iPhone, iPad and iPod Touch has been released, and several iOS users are upgrading / updating old iOS 7.1.2 / iOS 7.1.x iOS firmware to the latest iOS 8 firmware to explore newest available features and functionality changes. 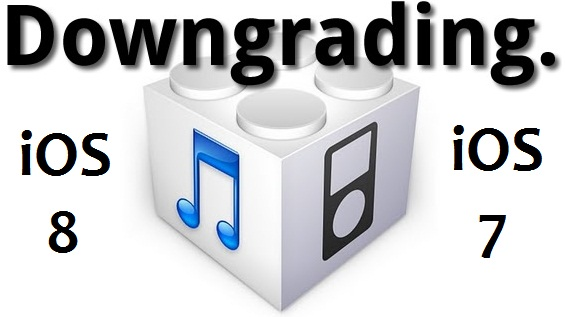 If you have recently upgraded / updated to iOS 8 Firmware but facing any kind of trouble and problem, then you can Downgrade from iOS 8 to iOS 7.1.2 / 7.1.x, because Apple is still signing latest available final iOS firmware i.e. iOS 7.1.2. Below working method, guide and tutorial will helps you in Downgrading Latest iOS 8.0 to Old iOS 7.1.2 / 7.1.x Firmwares Running on iPhone 6 Plus, iPhone 6, iPhone 5S, iPhone 5C, iPhone 5, iPhone 4S, iPod Touch 5G, iPad Air 2 6G, iPad Air 5G, iPad 4G, iPad Mini, iPad Mini 2, iPad Mini 3, iPad 3G and iPad 2G Using iTunes for Mac OS X and Windows. iOS 8 Firmware is currently available as latest iOS version from Apple, and after that Apple will released more updated versions for iPhone, iPad and iPod Touch users i.e. iOS 8.1 or iOS 8.2 firmwares after iOS 8 Final Version. But Apple is still signing iOS 7.1.2 Firmware and it will help users to get old iOS 7.1.2 firmware back and Downgrade to iOS 7.1.2 / 7.1.x from iOS 8 on iPad Air 2 6G, iPad Air 5G, iPad 4G, iPad Mini, iPad Mini 2, iPad Mini 3, iPad 3G, iPad 2G, iPhone 6 Plus, iPhone 6, iPhone 5S, iPhone 5C, iPhone 5, iPhone 4S and iPod Touch 5G. Step 1: First, Download all pre-requisite firmwares and software’s for your devices as mentioned above. Step 2: Now, Open iTunes software on Mac or Windows powered PC / Laptop while your iPhone, iPad or iPod Touch device is connected via USB cable. First, Hold down Power button for 5 seconds. Now, Press and hold Home button with continue holding Power button. Then, Wait for 10 seconds and keep holding Home button but release the Power button. Now, Leave home button when the device enters in DFU mode successfully. Step 4: After putting your device into 'DFU Mode', Your iDevice will be in 'Recovery Mode' on iTunes. Step 5: Now press and hold the 'Shift' keys on Windows and ‘Alt/Option’ keys on Mac OS X and immediately press 'Restore' button on iTunes. Step 6: After that, Select and open the 'iOS 7.1.2 IPSW' firmware in iTunes and Click on 'Restore' button when asked; now iTunes software will perform the rest task automatically. You have successfully Restored and Downgraded iOS 8 Firmware. Congratulations! !